So many new places to get lunch are popping up each day in the Nashville area. It can be overwhelming at times to keep up with them all. So much so that one can be overlooked that has been around for awhile. This weekend we went for a quick lunch at The Post East in East Nashville. A look at the website gave us an idea of the vegan offerings so we knew we would have a few choices. The Post East is situated on the corner of Fatherland and South 17th so depending on when you choose to visit parking may be a chore. They do have a small lot with about 6 spaces. Upon entering we were met with what I thought to be cats dying in a brawl while their tails were lit aflame. After discovering it was a just a bluegrass band I looked to see what outdoor seating was available only to find those 2 tables were already occupied, likely with people hoping to distance themselves from the barrage of bad banjo. I shut the band out of my mind and we stepped to the counter to take a look at the menu. A tall bearded man greeted us in a gruff, hurried manner and we told him we would like a few minutes with the menu. We compared then brunch menu and the regular menu and decided on our lunch. I decided on the Tofu Italiano, Chickpea Salad Sandwich and the kid wanted the vegan Belgian Waffle. We were told they were out of tofu, so back the menu for a second I went and came up with the BLT with tempeh. I was interested to see how they prepared their tempeh and if they served it with a tempeh bacon like most vegan BLTs. Finding a seat wasn’t too difficult. I think the fighting cats (read: bad bluegrass band) had driven off many or discouraged a few from dropping in. We found our table and waited. About 15 minutes passed and the kid’s waffle was brought to the table followed by, nothing. After a couple minutes of her staring at her food waiting for her parents to be served theirs before eating we told her to please eat. A kid needs her lunch regardless and manners have no place when hunger is in play. After reading every menu on the wall and discussing the coffee selection (The Post East only upcharges 25 cents for soy, almond or coconut milks in your latte) after 20 more minutes of waiting our sandwiches were brought to the table. Now, 20 minutes I could understand if perhaps the restaurant was so crowded it was standing room only or the sandwiches were some wild, fancy affair with a plethora of specially- prepared ingredients but before was was placed a chickpea salad sandwich consisting of a couple tablespoons of chickpea mixture with a slice of wilted lettuce on untoasted white bread served with blue corn tortilla chips. The BLT I was served caught my eye immediately. “that’s some fancy tempeh bacon.” I thought to myself only to realize that it was indeed pork bacon. I inspected the sandwich to find the aforementioned bacon resting on the stem tops of tomatoes, something that should never be served especially in a restaurant setting, between two pieces of toasted bread and served with the same blue corn tortilla chips. After confirming that I had indeed requested the vegan BLT I told the server and she apologized and took it back. Less than one minute I saw her returning with my vegan BLT. I thought this unusually quick considering it took over half an hour to prepare these sandwiches to begin. The sandwich I got back didn’t look much different. The bread seemed to be untoasted now as though the had rushed out a new sandwich and didn’t toast the bread to save time. I was OK with that. However on checking the kitchen had only replaced the top piece of toasted bread with untoasted. The pork bacon was now three thick slices of tempeh but the stem tops of the tomatoes were still there and the bottom slice of bread was the original toasted piece. Clearly they just pulled off the pork bacon, added the tempeh and put a fresh slice of bread on top. I won’t get into how many flavors of wrong this is. 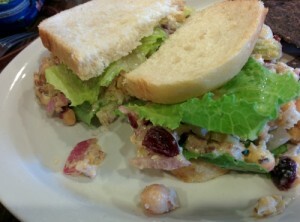 The Chickpea Salad Sandwich was tiny and uninspired at $9. I took a bite of the tempeh and found there was absolutely no marinating done. It was a cold piece of tempeh that had been on a grill for a few seconds at some point in its sad existence only to add some black marks to the exterior. Trying the chickpea salad sandwich gave no more happiness. Trying to come up with another word to describe bland is just bland. This sandwich could have used some type of spice or seasoning. It seemed it was just chickpeas tossed in a mayonnaise with celery, onion, raisins and little to nothing else. I set my eyes on trying the kid’s waffle which at this point was nearly gone with the time that had passed. Taking a bite I found it to be very good. Surprisingly so since I had set my bar quite low after the sandwiches. The waffle was done right and I only wish the sandwiches were as well. The kid’s vegan Belgian Waffle. 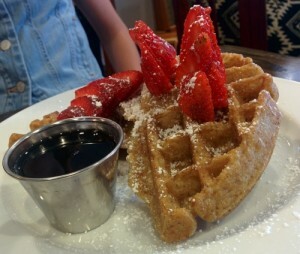 An oatmeal waffle with maple syrup and a large sliced strawberry (extra charge). This was the one good item from our order. Uninspiring and bland vegan food will win no meat-eater over. This is exactly what they expect. Vegans won’t return to eat the bland food. This is the worst thing I can think of to encounter in a restaurant serving a vegan menu because it plays right into the hand of the myth that vegan food is bad and has no flavor. The Post East is doing vegan food no favors with their vegan offerings. I will check back and hope things change at The Post East.